The Bible attaches great significance to what we observe in the heavens. Astronomical signs are God’s ‘bill-board’ for the world. They can occur on a regular basis, as in seasonal signs and the Hebrew calendar. They also occur as unique events, as in Israel’s history, and especially as end-time warnings to the world. Such warnings can come as signs in the sun, moon and stars, or possibly as asteroids or strange signs in the sky. 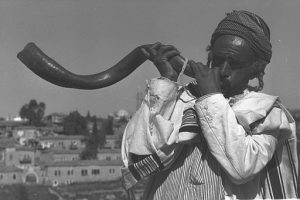 Either way, God’s timing of these celestial events is precise – there are appointed times and often they are associated with Israel’s appointed feasts (Numbers 9.2, Leviticus 23.2). Closer to home, Bible prophecy could refer to the observed wobble in the spin axis of the earth. So, apart from providing light, the moon provides man with a calendar – God’s calendar (see sidebar). It is claimed that this was no ordinary astronomical phenomenon in that it cannot be explained by any known astronomical law, link. So despite attempts to explain it by known laws, it remains a miracle of God, link. It was a sign from God to King Hezekiah that he would be healed and that he would live another 15 years. He did. There is much debate about the astronomy behind this text. For example, it has been argued that the ‘star’ of Bethlehem was a supernova, a comet, or a triple conjunction of Jupiter and the star Regulus in the constellation Leo, link. A triple conjunction event did actually occur around the time of Jesus’ birth. Here, Jesus is probably referring to the very last years of this age, when astronomical signs cause men’s hearts to fear for what is coming on the earth. Perhaps the key sign is “the sign of the Son of Man” that appears in the sky “with power and great glory” at Christ’s return to earth (Mat 24.30). The whole world will see this event. Revelation 6.13 refers to “stars of heaven falling to earth, as a fig tree drops its figs”. Here, the Greek word for stars is astéres, link. Thayer’s Greek Lexicon suggests that this may refer to comets and if the earth passes through the tail of a comet we observe a meteor shower. 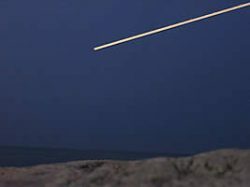 A meteor (burning space rock smaller than an asteroid) that survives the earth’s atmosphere falls to earth as a meteorite. Even today, meteors are sometimes referred to as ‘falling stars’. The text is given in an end-time context and Jesus probably refers to the same event in Mark 13.25. He was referring to dramatic cosmic events as signs of His return to earth. 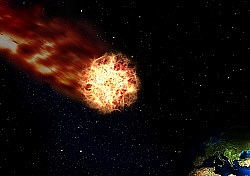 Although Earth is bombarded with millions of tons of space material each day, Jesus implies that such signs will become more apparent just before His return. Revelation 8.8,9 refers to “something like a great mountain burning with fire was throne into the sea … a third of the ships were destroyed”. This could be a biblical description of a future major asteroid impact in the sea, and, clearly, such an impact will generate a huge tsunami, link. Asteroid impact is certainly a reality. A Potentially Hazardous Asteroid (PHA) has the potential to make close approaches to the Earth and a size large enough to cause significant damage in the event of impact. The 1908 Tunguska asteroid (which nearly impacted) released energy equivalent to about 185 Hiroshima bombs, link. It was a timely warning. By January 2016 there were some 1,650 known PHAs, link. It only needs one to hit! Solar eclipses (especially total eclipses) are sometimes seen as conveying a serious message to mankind. For example, the total eclipse over the Russian army on August 21, 1914 occurred a few days prior to their massive defeat. August 21 was also the day German and British troops first clashed on the Western Front. And the May 9, 1948 (annular) eclipse over central Korea occurred just a few years before the Korean War, link. Solar eclipses are also associated with the birth of Mohammad, the Zulu War, and the Titanic, link. In contrast, there was no solar eclipse (total or annular) over Israel around May 14, 1948 – when the State of Israel was ‘born’ (see Solar Eclipses). In recent years, America (along with most of the Western World) has surely had a predisposition to sin in God’s sight. 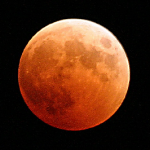 Biblical references to a ‘blood-red moon’ may sometimes refer to a total lunar eclipse. A total eclipse of the moon occurs when the moon falls entirely within the shadow of the earth i.e. when it enters the Earth’s ‘umbra’. It is only possible when the Sun, Earth and Moon are aligned in a straight line and when there is a full moon (although this does not occur every full moon because the plane of the Moon’s orbital path around the Earth is inclined at an angle of 5° to the Earth’s orbital plane around the Sun). Alignment is only correct twice a year, link. If we could look back at earth from within earth’s shadow we would see a red glow around the earth. These are earth’s sunsets and sunrises caused by atmospheric scattering of red light back to earth. This red light then illuminates the moon – hence the term blood-moon. A total lunar eclipse can last for hours as the moon passes slowly through the umbra, although its visibility varies depending upon date and time (usually half of the earth at a time). For example, the 15 April 2014 eclipse was best seen in the Western Hemisphere, whilst the 8 October 2014 eclipse was best seen from the Pacific Ocean. When four consecutive lunar eclipses are all total eclipses, the group is known as a tetrad. During the 21st century there will be 85 total lunar eclipses and also 8 tetrads occurring in 2003/4, 2014/15, 2032/33, 2043/44, 2050/51, 2061/62, 2072/73, and 2090/91, link. Having summarized the astronomy of blood moons, it is necessary to ‘connect the dots’ with what the Bible says on the subject. As already mentioned, the Bible says that at the end of this age there will be warning signs in the heavens, and these include blood-red moons! This may be a reference to solar and lunar eclipses in the last few years of this age (Joel 2.30,31), although astronomically, these cannot be simultaneous solar and lunar eclipses. If they are eclipses, they are just part of dramatic, awe-inspiring and fearful celestial sights as men realize the coming ‘wrath of the Lamb’ (Rev 6.16). Earth Splitting: A striking example is found in the East African Rift. This rift is splitting the African continent in two. The African plate (or Nubian plate) carries most of the continent, while the smaller Somali plate carries the Horn of Africa. A huge crack has already disrupted roads in Kenya, link. In fact, the African Rift is part of a long rift system that extends from Africa north through the Red Sea, the Dead Sea, and into the upper Jordan Rift Valley (past the Sea of Galilee), link. Is this great geological rift a cause of the future ‘great earthquake’ in Israel (Ezek 38.19)? Isaiah’s prophecy implies that the earth itself becomes physically unstable – it “reels to and fro”. This may refer to the heaving of the earth during an earthquake. Or does it apply to the whole earth? In verses 19 and 20 the Hebrew term for ‘earth’ is ‘erets’ (Strongs 776) meaning ‘the earth at large’ (as opposed to ‘soil’). The same Hebrew word is used in Genesis 1 verse 1 to refer to the whole earth. This view aligns with recent scientific analysis. Analysis suggests that the normal ‘wobble’ of Earth’s spin axis has recently become more eratic. So what’s happening? Earth’s Spin Axis: Earth’s geographical poles are the two points on the planet where its axis of rotation (spin axis) intersects its surface. The spin axis does not intersect the earth at the same place all the time but drifts slowly around, link. In other words, the geographic north pole moves around and is currently on its way to London! During the 20th century the spin axis migrated towards Canada, but around 2000 the axis started drifting east towards the UK, and with increased speed, link, link. The drift is currently about 7 inches (17 centimeters) a year, link. Although the drift is small, it still affects GPS systems and NASA sees the sudden drift to the east as a relatively “massive swing”. Explaining Earth’s Wobble: Spin a toy top. It rotates around a (usually) vertical axis. But give it a nudge and it wobbles about its spin axis. Earth is like that; given a ‘nudge’ it will wobble on its spin axis, as indicated in the diagram. For Earth the required ‘nudge’ arises when the spin axis moves geographic location i.e. when the pole moves. (Note: this wobble is not the same as Earth’s long-term precession, which is caused by the gravitational pull of the sun and moon on earth’s equatorial bulge, link, link. 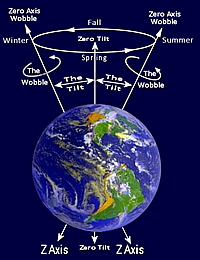 The wobble being considered here arises from within the Earth). Inevitably this means that the tilt of the earth to the ecliptic – nominally 23.5 degrees – varies (wobbles) slightly with time, link. If a sudden and rapid change in the axis of rotation is mainly due to the widespread depletion of water, this aligns with the theme of Isaiah 24, which says the earth will suffer severe heat and drought. A Biblical Explanation: There could be an even more serious ‘nudge’ to our spinning top analogy: asteroid impact (see above). End-time prophecy says that the earth will be hit by “something like like a great mountain burning with fire” (Rev 8 verse 8). 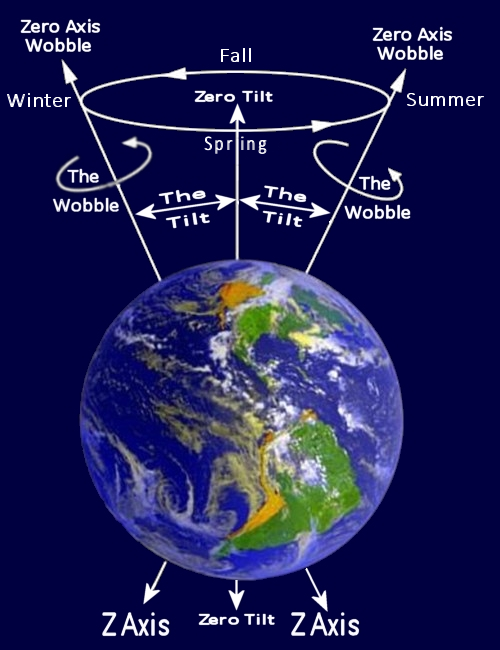 So is earth’s axis wobble what the prophet Isaiah saw when he says that, in the last days “the earth (as a whole) reels back and forth like a drunkard”. And will sudden axis shift cause unwelcome changes to the earth, link, link?